We were in Taiwan a couple of weeks ago to check out what Asus had to show off to the world at COMPUTEX 2018. While all eyes were understandably on the company’s new gaming phone, a couple of other releases may have fallen by the wayside. 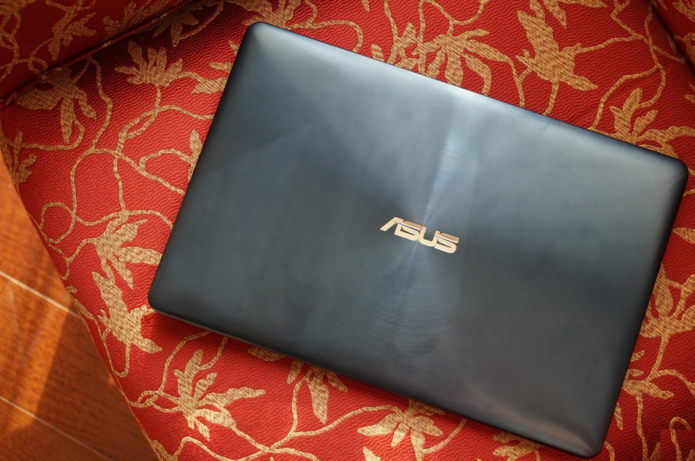 One of those products is the Asus Zenbook Pro 15; a refresh of their Ultrabook line. Along with its hardware upgrades, Asus also bring something new to the table to combat Apple’s Touch Bar — the ScreenPad. Is it worth the ask though? Hopefully, we can help you find that out by the end of this review. Notebooks? Gaming Laptop? Ultrabook? All these terms can be a little bit confusing to those who might not be familiar with the layout of the tech scene but an Ultrabook is essentially a laptop that has high-end hardware that maintains a sleek and thin design, unlike gaming notebooks. There are a few compromises to achieve that, as one would expect, but we’ll get to that as we go through our review. Is It a Breeze to Take Around Town? The team is always on the lookout for a powerful notebook that won’t give us a backache when we have to take our work on the road and this easily ticks all our requirements. As you can glean from its name, this Zenbook Pro is a 15.6-inch notebook though there is a 14-inch variant if you want to go even more portable at the expense of a little zip under the hood. The Zenbook Pro 15 is 1.89cm thin and only weighs 1.6kg; almost a full kilo less than the usual notebook we have in our gear bag. In terms of design, this new Zenbook Pro doesn’t deviate from its predecessors but still looks pretty darn sharp. The lid bears the concentric circles that Asus is known for with the whole unit build out of aluminum and, as you can expect, it has very minimal flex. There’s a bit of gold trim that goes around the body, which breaks up the deep blue and gives the laptop an air of elegance. Is the Display Any Good? Short answer. Yes. We already mentioned the screen size earlier but we didn’t talk resolution and what makes it such a good display. The variant that was sent to us had a 4K UHD touchscreen that has a 100-percent Adobe sRGB color gamut and is also PANTONE certified, which means if you need to anything that requires colors to be spot on then this definitely won’t disappoint. The photos we took of it don’t do it any justice and it’s best-experienced firsthand. Honestly, I am little sad that I’m back on my daily driver and definitely miss the vividness of the panel on the Zenbook Pro. You can opt for a variant that only has a Full HD that’s still a touchscreen panel with the same color gamut if you want to save a bit of cash. Under the hood of the Asus Zenbook Pro 15 UX580 is an 8th generation Intel Core i9 processor, 16GB of RAM, 1TB SSD storage, and a GTX 1050Ti. All this hardware works together to make a really powerful machine that’s capable of handling pretty much anything you throw at it. If you edit photos or videos, this laptop has all the muscle you need to handle your workflow. We’ve been using it to edit the videos you’ve been seeing on our YouTube channel this past week and we were able to export most of them in less than 5 minutes; not bad at all since we do use 4K files downscaled to Full HD. If you do need to unwind after a long day, don’t worry the Zenbook Pro can game too. We spent most of our time playing Overwatch in 4K, set on High and frame rates were really smooth; even smoother if you bump down the resolution. You can play some of the newer triple-A games but you’ll have to lower settings as the 1050Ti will definitely be the bottleneck in this configuration. You’ll need to game sporadically and avoid long gaming sessions since the cooling system on this baby isn’t really meant for that sort of thing. It’s one of the compromises we talked about earlier. Is the ScreenPad Really All That? Asus got a serious nod of approval when they unveiled the ScreenPad at briefing they held for media at their HQ in Taiwan. It could have easily been seen as a gimmick but it does have some serious uses to help with productivity. We’ll cover that while we talk about the three different modes you can set it in; all accessible by pressing Fn+F6. First is good ‘ol regular ScreenPad Mode. This basically displays a pre-selected wallpaper on the ScreenPad where you can swipe down from the top and reveal a few applications you can use such as the Calculator, Calendar, a Music Player, or even Spotify if you’d rather stream your tunes. Asus says they’ll be working with other App Devs to introduce more functionalities to the ScreenPad but that’s pretty much it for now. You can also use the ScreenPad as a secondary display. We found this particularly helpful but it can be a bit of a double-edged sword. In this mode, we used it to extend then Workspace on Premiere Pro and have the video we were editing on the ScreenPad itself. We imagine there are various use cases in this mode, such as using it to compare different Worksheets on Excel and whatnot. You can also have a video playing on the ScreenPad though we’re guessing your boss might not be happy with that kind of multitasking. The third mode is just having the ScreenPad behave like a regular TouchPad, which we recommend using if you want to maximize the battery life on this notebook. What About the Rest of the Laptop? Not everything was hunky dory with the Zenbook Pro. The keyboard, for instance, felt a little mushy and wasn’t the best experience we’ve had with one of the company’s notebooks. It’s something you’ll get used to as time goes by but bears mentioning so you know what to expect if you do decide to pick it up. The port selection on the Zenbook Pro is also rather limited. You do have a everything you need (which includes: 2x USB 3.0 ports, 2x Thunderbolt ports, an HDMI port, a MicroSD slot and an audio jack) but since USB-C peripherals aren’t the norm just yet, expect to live the dongle life if you need more than those two USB 3.0 ports. Our biggest complaint, however, is the lack of a full-sized SD card slot. Ugh. On the up side, you’ve got speakers tuned by Harman Kardon to go with the gorgeous display so consuming content on the Zenbook Pro was an awesome experience. How About Its Lasting Power? Well, that depends on what you’re doing really. If you’re just checking your email and typing up some documents, then you should be able to squeeze out about 4 to 5 hours of juice on the Zenbook Pro. If you’re doing anything else, like gaming or editing videos, then you’ll definitely want to be near a wall outlet since you can expect that time to be significantly lower the harder the notebook works. The Asus Zenbook Pro 15, or even the 14-inch variant, is a perfect fit for the digital nomad who’s in need of a notebook with a lot of oomph but wants to maintain an air of sophistication. It fulfills anything and everything that an Ultrabook is meant to deliver with the added flair that the company’s new ScreenPad brings. We’re not going to lie. At $2,529, It costs as much (or probably more than most of the gaming notebooks in the Asus Republic of Games sub-brand) but if you find yourself in need of a machine that’s more for work than play then it’s definitely worth considering; though you can bust out a couple of games to de-stress too. If you want to save a bit of cash, we suggest going for the variant with a Full HD panel instead or maybe the one without the ScreenPad too but expect performance to take a dip with the hardware changes.